Unstructured, outdoor play combined with character development instruction has shown preliminary associations with improved cognitive functioning and classroom behaviors. The purpose of this study was to further evaluate these components of the LiiNK Project (Let’s inspire innovation ’N Kids) when including intervention and comparison school children. The intervention consists of four 15-min recesses, scheduled throughout the day in combination with four 15-min character development lessons taught weekly to improve the elementary classroom learning environment. The second year of this longitudinal study included grades kindergarten through second grade students (N = 405) from two demographically comparable private schools in the southwest region of the United States. One school implemented the intervention, while the other school maintained current protocols. The intervention teachers adhered to the four play breaks at a rate of 92% over the course of the intervention. Transitions from classroom to playground and back dropped from 4 min each way to less than 1 min each way. The results of comparing the two schools showed classroom off-task behaviors such as fidgeting and moving around the room decreased significantly, while attentional focus improved significantly as a result of the intervention. LiiNK Project results from grades kindergarten and 1 in the same schools last year are congruent with the results of this study. Next steps will include public school expansion to explore student diversity among rural, urban, and suburban environments with the play and character intervention. A disconcerting shift toward increased classroom time at the expense of physical education and recess has created a detrimental effect on children (Robert Wood Johnson Foundation, 2013; Rhea et al., 2016; Ramstetter and Murray, 2017). The belief that increased classroom content time will ultimately produce better learners has been lackluster at best (Howie and Pate, 2012; Centers for Disease Control and Prevention, 2015). While the importance of classroom time for students is indisputable, it must be recognized that time spent in an increased number of specific content minutes daily is only as valuable as the quality of delivery and the willingness of children to receive the information (Pellegrini and Bohn-Gettler, 2013). The opportunity to play and be physically active lead to better mental acuity and socialization skills, but both have been minimized from the school day for increased classroom time and safety issues (Turner et al., 2013; Centers for Disease Control and Prevention, 2015). When students are confined to the indoors with limited time to play and socialize for much of the 7 h they are in school, the brain becomes less receptive and many negative behaviors occur such as bullying and aggression (Stein and Dubowitz, 2015; Case et al., 2016). Recess, an integral part of the developing child, provides an unstructured, outdoor, unassisted play time encompassing cognitive, social, and emotional health components (Milteer et al., 2012; Gray, 2013; Rhea, 2016). Rhea et al. (2016) and Gray (2013) have stated that unstructured, outdoor play breaks throughout the day are necessary for healthier children and continuity of learning. Unstructured play prompts changes in the prefrontal cortex, the critical region of the brain’s executive control center, responsible for regulating emotions, making plans, and solving problems. This type of play not only enhances normal social development but also promotes better thinkers and therefore better learners (Milteer et al., 2012; Murray et al., 2013; Pellegrini and Bohn-Gettler, 2013; Rhea, 2016). Erickson et al. (2015) found that students need an unstructured, outdoor play experience to reset the brain for learning instead of simply taking short breaks in the classroom or changing of subject content. Different play interventions have implemented brain breaks to improve academic focus, quality of life, and socialization skills among children (Bundy et al., 2011; Hyndman et al., 2014). The results have shown that recess can be a healthy outlet for children; it can increase physical activity on the playground; and when character traits are taught in the classroom, children’s social skills are enhanced and their ability to think through the problem before acting is seen more often. While these results are promising, less outdoor time is provided because teachers find it hard to maintain control of the children (Snyder et al., 2010). Bullying is at an all-time high, and the student’s inability to socialize with each other can lead to aggressive and disruptive interactions (Erickson et al., 2015; Case et al., 2016). The combination of minimal recess and lack of quality character development results in a less than ideal learning environment. Some studies have found that when character traits are taught in the classroom, children’s social skills are enhanced, and their ability to think through the problem before acting is seen more often (Davis and Cooper, 2011). Studies have also shown that character building in boys early on is highly influential for long-term academic achievement and lower dropout rates in the middle and high school levels (Davis and Cooper, 2011; van der Niet et al., 2015). 1. Increasing the amount of time allotted during the school day for unstructured, outdoor play. Four 15-min recesses, two before lunch and two after lunch, totaling 60 min daily are implemented. If the school already has one 15-min recess daily, this results in an increase of 45 min daily for unstructured, outdoor play. Many teachers have used recess as a carrot or reward to maintain acceptable behavior in class. Teachers are prohibited from removing any of the recesses daily for discipline issues or academic performance. Physical education classes cannot take the place of recess. Unstructured recess for this intervention is defined as free play that is directed by the children themselves in a safe environment with no adult influence (Gray, 2013; Sahlberg, 2015; Rhea et al., 2016). 2. Introducing a character development curriculum called Positive Action® (Positive Action® Inc, 2007) designed to be included as a part of the overall classroom content by grade level, which emphasizes seven character traits: empathy, respect, honesty, prosocial behaviors, engagement and disaffection with learning, bullying, and school connectedness. Integrating PA creates common social and emotional skill development throughout the school culture and creates a safer space to work and learn. The intervention requires that the English/language arts teacher from each grade level implement four 15-min lessons weekly. The teacher kits include introductions, purpose statements, activity sheets, and one hundred and forty 15-min scripted lessons. The teachers read the lesson exactly as stated from the manual each day and follow all activities as required from the manual. 3. Providing three full day required teacher/administrator strategic trainings to prepare for the LiiNK intervention. These training days are scheduled in the spring before the intervention begins the following first day of the school year. The first training is focused on changing the teacher’s mindset related to being outdoors and taking time to re-energize themselves and their students. The second training focuses on how to implement multiple recesses daily and teach the Positive Action curriculum. The third training orchestrates all of the strategies learned so that the intervention launch can be seamless. In its first year, the LiiNK Project intervention showed preliminary support for the theory of play (Rhea et al., 2016). Rhea et al. found through anecdotal teacher reports that less bullying behaviors and more positive social interactions were observed on the playground among the students as a result of multiple opportunities daily to play through self-direction. In the same study, results showed that children were significantly less likely to misbehave in class, significantly more likely to be attentive, and significantly less likely to be disruptive in the school setting as a result of the intervention. School administrators have reported a perceived lack of time for multiple play breaks daily as being a major obstacle of doing this intervention, not that it would be detrimental to have more play in the day (Robert Wood Johnson Foundation, 2013). Further, they believe that recess limits instruction time to teach test specific material, therefore diminishing performance on assessments and reducing state and federal funding. Other countries have chosen to adopt a more active school environment, allowing time for recess and physical education without sacrificing academic achievement. In Finland, the government requires a 15-min outdoor, unstructured break every hour as well as maintaining PE as a content area daily (Finnish National Board of Education, 2016). On the most recent 2015 PISA scores, they ranked 3, 5, and 10 in reading, science, and math, respectively, which continues to reveal the power of structured and unstructured play in their curriculum (Organization for Economic Cooperation and Development, 2016). East Asian countries, ranked 1–7 in math, 1–4 in science, and 1–5 in reading, allow their elementary aged students a 10-min break for every 40 min of instruction (Sahlberg, 2015) and are also continually outperforming the United States (Organization for Economic Cooperation and Development, 2016). Since American children average more than 7 h daily in a school setting 10 months of a year, this is one place where efforts to build social emotional learning and increase the ability to socialize, think, and process should begin (Flay and Allred, 2010; Milteer et al., 2012; Rhea, 2016). The purpose of this study is to further evaluate the effectiveness of the LiiNK Project intervention to improve the elementary classroom learning environment. LiiNK is designed to incrementally add a grade level each year to examine the totalitarian effects of the intervention; therefore, grades K through 2 are included in this study. The research question asked was whether additional recess (unstructured, outdoor play) in combination with a character development curriculum could decrease off-task behaviors and improve listening skills in kindergarten through second grade students. Hypothesis 1: Intervention children will decrease in off-task behaviors over the control children in grades K through 2. Hypothesis 2: Intervention children will score higher in listening skills over the control children grades K through 2. All kindergarten, first, and second grade students from one private school implemented the intervention, while all kindergarten, first, and second grade students from another private school served as the comparison school. The two schools were matched on demographic and performance variables such as race, ADHD medications, gender, socioeconomic status, and achievement test scores. Of the total number of students included in this study (N = 528), the intervention school had 54 Grade K, 64 Grade 1, and 65 Grade 2 students, whereas the comparison school had 74 Grade K, 72 Grade 1, and 76 Grade 2 students. Less than.05% of the students at either school were on ADHD medications; over 93% of the population at each school were white; students per classroom were between 17 and 22; males represented 47–52% of each of the three grade levels; and neither school had Free or Reduced-Price lunch programs. At or above math and reading score percentages for grades K–2 students in both schools were similar. The intervention school modified the number of recesses LiiNK required daily to accommodate the very intense curriculum they offered for grades K–2 (two foreign languages plus English taught daily). So the treatment for this second year of the intervention offered three 15-min recesses daily instead of four. The four 15-min PA character lessons weekly were delivered as intended. This study incorporated the same measures as were used in Year 1 of the LiiNK Project (Rhea et al., 2016). All measures included a fall (September/October) and spring (April/May) collection period. Accumulative data are included to show the changes from Year 1 to Year 2. The observation of students in the classroom utilized an eight-item tool, which monitored off-task, inappropriate, and appropriate behaviors in the classroom (Marchant, 1989). Off-task is defined as showing verbal or non-verbal behaviors that are distracted from teacher directives. Inappropriate is defined as showing physical or emotional maladaptive behaviors, and appropriate behaviors are congruent with teacher requested behaviors. The following four off-task behaviors were monitored: off-task moving—movement out of the seat or away from the learning area; off-task stationary—movement while remaining in same location such as fidgeting; off-task vocal—student speaking to him or herself or with one other (only involving a total of two students); and off-task low tone—involved a student staring off into space or head down while clearly not engaged. The three inappropriate behaviors monitored were (1) self-injurious, which included behavior harmful to the student such as hitting himself or herself; (2) disruptive, which was any action that took the attention of three or more students away from the lesson; and (3) aggressive, which was any harmful behavior directed at another student. The inappropriate behaviors were not included in the results of this study due to less than 0.01% being observed. This measure also included demographic type questions such as number of students by male and female, teacher name, which location (e.g., classroom), observer name, and time observation began. Following the completion of the classroom identifier items (grade level, time of day, classroom teacher, observer name, and before or after recess), the rater participated in a 10-round observation. Each round consisted of a 10-s behavior observation of one student. Whatever behavior category was dominant in that 10-s measurement was recorded. The rater then moved to the next student. All students were measured in each round. An open-ended comment section allowed for detailed descriptions of the behaviors that were tallied during observation. This tool is used to measure a student’s ability to listen to a selection with a designated readability level and respond orally to five comprehension questions (Brigance, 2010). The listening comprehension assessment takes between 3 and 5 min per student. This measure has been used as a diagnostic reading tool in school settings for over 20 years and is used with grades K–9 students presently (French and Glascoe, 2010). A trained diagnostician read students a two- to three-line story and asked the students to answer four to five questions relating to the passage (Brigance, 2010). If the answer fits to criteria related to story content, then the student received one point for that question. If the answer did not relate to the story, then the student did not receive credit (score of 0). Students are not required to include every possible detail in their responses. If needed, a follow-up question could be asked to encourage the student to clarify or to be more specific to evaluate the response. However, the follow-up question should not give clues. If the student responded to the first four questions correctly, credit could be given without asking the last question. Two stories were read at each session with five questions asked per story in each grade level. Scores were calculated as raw and percentage with a 4/5 (80%) accuracy expected for each grade level. All classroom teachers were provided with a recording sheet that allowed them to report the number of recesses attended each day by the teacher and his/her class. This recording sheet included a daily calendar with four lines corresponding to the four possible recess times (two before lunch and two after lunch). The teacher would respond with a simple yes or no for each possible recess time. The recording sheet also allowed the teacher to record which Positive Action lesson was taught (if any) that day. The reverse side of the recording sheet included open space for any comments relating to why a recess or a Positive Action lesson was missed. The teacher could also describe anecdotal stories that showed behavior changes throughout the intervention. These recordings were used to measure the percentage of time the teachers followed the scheduled protocol daily as stipulated for recess and character development. 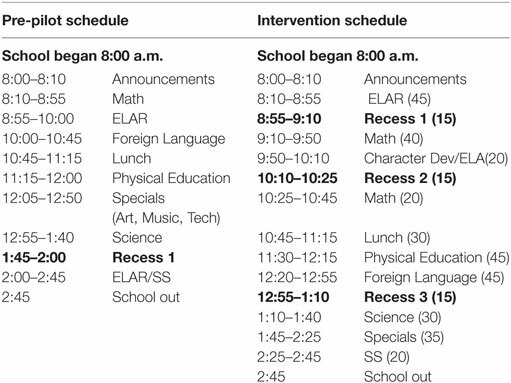 The schedule presented in Table 1 shows the exact time of day for teachers of each grade level to engage their classes in outdoor play and the character curriculum. Table 1. Comparison of baseline school schedule and intervention schedule. This study was approved by the Texas Christian University Institutional Review Board for the second year of a three-year project (Rhea et al., 2016). Written permission and informed consent were granted by the headmasters, principals, teachers, and parents of all children involved in one intervention and one comparison school to observe up to three times per semester in each classroom, to observe their one recess daily, and to assess the listening focus of the children. No changes were made to the comparison group school day nor the content they taught. This particular school did have a before school active time of about 30 min daily, which the intervention school does not have. During school, the children engaged in one 30-min recess, with no formalized character development curriculum taught weekly. Not every child participated in the before school active time nor did all teachers always take their children outside for recess one time daily. To alleviate any confusion, in the first year of the project, baseline data were collected on kindergarten and first grade classrooms in the fall semester (2013) and then the intervention began at the beginning of the spring semester. 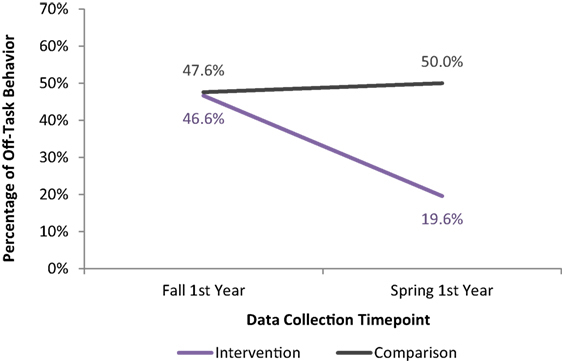 Testing was completed near the end of the spring semester (2014) to evaluate the effects of the 4-month intervention in Year 1 (Rhea et al., 2016). No comparison groups were examined in Year 1. The first year’s study goal is to confirm the intervention steps worked, so no comparison school was involved. In Year 2 (2014–2015), one intervention school and one comparison school were studied for 9 months and included grades K–2. The children who had begun the project in kindergarten and first grade in the first year continued to receive the intervention and to be evaluated into their following year of school. These students were the intervention cohorts who were in first and second grades during the second year of the project. In addition, the kindergarten students who entered the intervention school during the second year of the project participated in the intervention during the fall (2014) and spring (2015) semester and were also evaluated near the beginning of the fall semester and near the end of the spring semester. Fall and spring data were collected on kindergarten, first, and second grade students in the second year of the project for the comparison school. The effectiveness of the intervention was evaluated by analyzing classroom-level observations of off-task behaviors and listening focus. For analysis of the classroom observation measure, the percentage of overall off-task behaviors, along with the percentage of separate off-task behaviors, were evaluated. Each classroom was observed on 3 separate days (hereafter referred to as a session) at different times of the day either before or after a scheduled recess/play break. Due to the multiple days observed in each classroom, and the fact that children switched classrooms in between school years, the classroom data were evaluated by considering semesters as independent groups rather than paired samples. For analysis of the listening measure, individual children’s listening data were recorded at each time point. Children who were in the intervention classrooms in the first year of the project had four time points of data. Those who entered the project in the second year had two time points of data. Because individual children’s scores were recorded, repeated measures analysis was possible for the listening evaluation. Cohort changes from semester to semester were evaluated first by computing mean scores and SDs for the intervention and comparison classrooms at each data collection point as shown in Table 2. Changes from semester to semester were evaluated with paired t-tests for the listening measure and independent samples t-tests for the classroom observations. The cumulative effect of the intervention was evaluated by comparing the intervention group to the comparison group at fall 2014 and spring 2015 using 2 (semester) × 2 (group) ANOVAs. Pairwise t-tests were used to further delineate significant interactions and main effects. IBM SPSS version 23 was used for all statistical analysis. Table 2. Means and SDs of percentage off-task type behavior by group and semester. To observe in the classroom, LiiNK team leaders trained the raters over a 2-week period prior to sitting in a classroom to observe the students. During this time, the future raters watched videotaped segments and marked their observation forms. They were then compared to an experienced rater for reliability. Once the potential rater showed consistency in video observation sessions, they practiced in the classrooms for 5 days with an experienced team member in the same room collecting the same student off-task behaviors. Once the new raters showed consistency of results with experienced team members, they were able to observe on their own. Five observation raters were used in Year 2 of this data collection phase. The interrater reliability was 0.92. The results are presented in several sections. First, adherence to the intervention is presented followed by how well the students transitioned from the classroom to the playground and back to the classroom. Then, listening focus and off-task behavior changes from semester to semester are presented for each cohort and between the intervention and comparison groups. Finally, differences in these outcomes by grade and gender are presented. T-values where a correction was made due to unequal variances (Levene’s test, p < 0.05) are marked with an asterisk. Year 1 of the intervention showed high recess adherence rates for the kindergarten and first grade teachers (Rhea et al., 2016). Recess was practiced less than 5% of the time indoors as a result of bad weather. For Year 2, the data reflected similar results even after adding a second grade group to the intervention. The Year 2 adherence rates were as follows: grade K (85%), grade 1 (91%), and grade 2 (87%). Recess and character development adherence was determined by taking the number of times recess and character development occurred each week and dividing that into the total number of times the teachers were scheduled for recess and character development each week. Irregular school days (e.g., special events, field trips, shortened days), which inhibit full intervention schedule, were not taken into consideration when calculating recess adherence rates. Therefore, the actual recess adherence rates were likely higher than those presented. This will need to be calculated differently in future studies. All three groups reported 100% Positive Action adherence for that same period. The reason being Positive Action lessons can be taught any time during the day. A concern for teachers is whether transition time to and from recess would increase as a result of increased number of recesses daily. In year 1, the transition time dropped from 4 to 5 minutes each way for one recess daily to 50 s to 1 min each way with three recesses daily. In Year 2, the transitions remained similar even for the new intervention group of kindergarten children. The mean percentage of off-task behaviors was computed for each cohort over the four time points with the intervention and comparison classroom percentages shown as separate lines, see Figure 1. A series of comparisons were conducted to evaluate differences from semester to semester. First the intervention group was evaluated for each cohort. Results showed significantly less off-task behaviors during spring 2014 than for fall 2013 for the cohort currently in second grade, t(17) = 8.63, p < 0.001, and the cohort currently in first grade, t(15) = 2.91, p = 0.011. In both of these cohorts, the percentage of off-task behaviors was significantly higher in fall 2014 than in spring 2014, t(16) = 3.27, p = 0.005, t(11) = 2.37, p = 0.037, respectively. This difference is shown in Figure 1 as the dashed line marked as summer. Figure 1 also showed that for both kindergarten cohorts, the percentage of off-task behaviors did not change significantly between fall 2014 and spring 2015 for either the intervention or comparison group (p > 0.05). Finally, comparisons were made between the first (fall 2013) and last (spring 2015) time point. For both cohorts, the percentage of off-task behaviors was significantly lower in spring 2015 compared to fall 2013, indicating that decreases in off-task behaviors that were observed during the first year of the intervention were also present at the end of the second year (cohort currently in second grade, t(12) = 5.36, p < 0.001, and the cohort currently in first grade, t(16) = 2.20, p = 0.043). Figure 1. Mean percentage of off-task behaviors at each time point by group and cohort, (A) cohort first grade in 2013-2014 school year, (B) cohort kindergarten in 2013-2014 school year, (C) cohort kindergarten in 2014-2015 school year. To determine whether intervention classrooms, in their second year of the project, had fewer off-task behaviors than the comparison classrooms, differences in off-task behaviors between the intervention and comparison classrooms were tested using 2 (semester) × 2 (group) ANOVAs for each cohort using data from the 2014–2015 school year, which is depicted in Figure 1. It was expected that each cohort would show a main effect for group, indicating that off-task behaviors were lower in the intervention group compared to the comparison group. Results indicated that for all three cohorts, there was a significant main effect of group, indicating that the comparison classrooms had more off-task behaviors than the intervention classrooms [cohort currently in second grade, F(1, 32) = 29.45, p < 0.001, partial η2 = 0.479, the cohort currently in first grade, F(1, 31) = 17.91, p < 0.001, partial η2 = 0.366, and the cohort currently in kindergarten, F(1, 29) = 19.42, p < 0.001, partial η2 = 0.401]. No cohort had a significant interaction between semester and group, which was expected because all intervention classrooms had already begun the intervention prior to fall data collection. The cohorts currently in second and first grade classrooms had been in intervention during the previous year and the kindergarten classrooms had been in intervention for several weeks prior to data collection. The mean percentage of listening items correct was computed for each cohort over the four time points with the intervention and comparison classroom percentages shown as separate lines, see Figure 2. A series of comparisons were conducted to evaluate differences from semester to semester. First, the intervention group was evaluated for each cohort. Results show significantly more listening items correct during spring 2014 than for fall 2013 for cohort currently in second grade, t(61) = 10.57, p < 0.001, and the cohort currently in first grade, t(59) = 13.08, p < 0.001. In both of these cohorts, the percentage of listening items correct was significantly lower in fall 2014 than in spring 2014, t(61) = 8.93, p < 0.001, t(56) = 12.80, p < 0.001, respectively. This difference is shown in the figure as the dashed line marked as summer. For both cohorts in the intervention group, the percentage of listening items correct was significantly higher in spring 2015 than in fall 2014 (cohort currently in second grade, t(59) = 2.28, p = 0.026, and the cohort currently in first grade, t(57) = 12.71, p < 0.001). In addition, the percentage of listening items correct was significantly higher in spring 2015 than in fall 2014 in the comparison group for the cohort currently in first grade, t(63) = 8.29, p < 0.001, but not for the cohort currently in second grade, p = 0.255. Figure 2. Mean percentage of listening comprehension at each time point by group and cohort, (A) cohort first grade in 2013-2014 school year, (B) cohort kindergarten in 2013-2014 school year, (C) cohort kindergarten in 2014-2015 school year. To determine whether intervention students, in their second year of the project, had demonstrated improved listening skills over the comparison students, differences in listening scores between the intervention and comparison students were tested using repeated measures 2 (semester) × 2 (group) ANOVAs for each cohort using data from the 2014–2015 school year, which is also depicted in Figure 2. Results indicated that for all three cohorts, there was a significant interaction between semester and group (cohort currently in second grade, F(1, 131) = 5.63, p = 0.019, partial η2 = 0.041; the cohort currently in first grade, F(1, 124) = 5.07, p = 0.026, partial η2 = 0.039; and cohort currently in kindergarten, F(1, 117) = 24.59, p < 0.001, partial η2 = 0.174). For the cohorts currently in second grade and first grade, there was no difference between the intervention and comparison group in the fall, p > 0.05. In the spring, the intervention groups had a significantly higher percentage of listening items correct than the comparison groups, t(132) = 2.76, p = 0.007 and t(131) = 2.88, p = 0.005, respectively. For the cohort currently in kindergarten, the comparison group had significantly more listening items correct than the intervention group in the fall, t(122) = 2.14, p = 0.034. In the spring, the intervention group had significantly more listening items correct than the comparison group, t(119) = 5.38, *p < 0.001. In this section, analyses were conducted on each classroom’s first semester of participation in the study to evaluate the effect of the intervention. The second year of intervention data were excluded from this analysis because the cohort was in the intervention in the previous year and started the school year with significantly less off-task behaviors. Thus, fall intervention data in the second year is not a pretest but another posttest. The intervention data were compared to the percentage of off-task behaviors in comparison classrooms from a separate school, see Figure 3. A 2 (group) × 2 (semester) ANOVA revealed a significant interaction between group (intervention vs. comparison) and semester (fall vs. spring) on the percentage of off-task behaviors, F(1,109) = 26.35, p < 0.001, partial η2 = 0.195. For the intervention group, the percentage of off-task behaviors in the fall was significantly higher than in the spring, t(31) = 5.90, *p < 0.001. For the comparison group, there was no significant difference in the percentage of off-task behaviors between fall and spring, p = 0.517. During the fall semester, there was no significant difference between the percentage of off-task behaviors between the intervention and comparison group, p = 0.848. During the spring semester, the percentage of off-task behaviors was significantly lower for the intervention group compared to the comparison group, t(56) = 9.58, *p < 0.001. Figure 3. Mean percentage of off-task behavior in the fall and spring of the first year that the intervention and comparison groups were in the project. Before conducting individual ANOVAs on each of the specific off-task behaviors, a multivariate analysis of variance (MANOVA) was conducted due to positive significant correlations among most of the specific off-task behaviors (p < 0.05). The multivariate 2 (group) × 2 (semester) MANOVA revealed significant main effects for group and semester as well as a significant interaction, F(4, 106) = 7.78, p < 0.001, partial η2 = 0.227. Thus, individual two-way ANOVA is presented for each individual off-task behavior. The significant interactions between group (intervention vs. comparison) and semester (fall vs. spring) were found for off-task stationary behaviors, F(1,109) = 21.70, p < 0.001, partial η2 = 0.166 and for off-task low-tone behaviors, F(1, 109) = 9.72, p = 0.002, partial η2 = 0.082. No significant interactions were found for off-task moving behaviors (p = 0.360) or off-task vocal behaviors (p = 0.383). The means and SDs are shown by time of year, grade, and group in Table 2. This study examined the second year of the LiiNK pilot intervention and supported the hypothesis that additional recess (unstructured, outdoor play) and a character development curriculum could decrease off-task behaviors and improve listening skills in kindergarten through second grade students in a private school in the southwest region of the United States. The intervention and comparison schools were matched by socioeconomic status, gender, and grade level. The preintervention data showed that the schools demonstrated similar off-task classroom behaviors and listening skills. School 1 (intervention) had a character development curriculum that was taught four times weekly, whereas school 2 (comparison) emphasized a character philosophy, but did not engage in weekly curriculum lessons. School 2 began with an unstructured, outdoor play time from 7:30 to 8:00 a.m. before going to their first class at 8:00 a.m., whereas school 1 began at 8:00 a.m. with no unstructured, outdoor activity before the first class. Typically, teachers have used recess as a carrot for children to behave in class. The teachers involved in this intervention were not able to withhold recess as a result of misbehavior in a class. They were instructed that recess was considered a content time just as the other contents were scheduled and were expected to adhere to the schedule. The teachers adhered to this protocol throughout the whole year without issues. In fact, if the weather was bad and the students could not go out for a couple of days, they were still expected to provide indoor, unstructured recesses for the same time periods that were scheduled for outdoor, unstructured recess times. The teachers saw how different the children were when they were able to go out for recess daily that they would get the students out for their unstructured, outdoor recesses as soon as possible once the weather cleared up. Through LiiNK training, the teachers learned how to transition from the classroom to the playground and back without losing valuable time organizing students and moving them in and out of the classroom. This is always one of the biggest fears for administrators and teachers discussing whether having multiple recesses will distract from their classroom learning time. The results have shown over this 2-year pilot phase that the teachers are able to transition the way the LiiNK intervention intended. In fact, the intervention teachers used less time over three recess periods daily (50 s each way per recess; <6 min total for three recesses) than they did when they only had one recess period daily (4–5 min each way; 8–10 min total for one recess). The comparison school demonstrated traditional times of transition just like the intervention school before being taught the LiiNK style of transition. One of the key questions of this intervention was whether off-task behaviors would decrease and the ability to focus would improve as a result of recesses dispersed throughout the day and the character development curriculum taught weekly. The intervention students in grades K–2 demonstrated that overall classroom conduct, the ability to focus, and academic on-task behavior were higher in students who received the recesses throughout the day and character lessons weekly. Also, there was decreased fidgeting, movement in the classroom, and staring into space over the comparison group who received only one recess and no weekly character curriculum. Grades 1 and 2 students had been involved in the intervention for a year and a half and continued to show decreases in off-task behaviors and disruptive conduct and improvements in listening focus by the end of each year, whereas the comparison school group did not. Figure 3 demonstrated that when the grade level groups were not measured independently of one another by school, but as a total group receiving the intervention or not, the intervention school significantly improved over the comparison group in off-task behaviors and listening skills. In fact, the comparison school students still reflected an increase in off-task behaviors, while the intervention students decreased significantly over a 9-month period. The off-task behavior results of this second year pilot can look deceiving across grade levels and over time. Since the intervention baseline data were measured in the fall of 2013 without a comparison school baseline, one might think that baseline comparisons of one group to the other could not be made. Contrary, the fall 2014 data for the comparison school were very similar to the fall 2013 data of the intervention school with the same grade levels. Another deceiving result was no significant intervention group difference was found from fall 2014 to spring 2015. This is not where the most important results should be considered. All three intervention semester results decreased significantly from the fall 2013 baseline results. Although spring 2015 results were not significantly different from fall 2014, they were down by 4–9%, which is still trending in the right direction. Most likely, the reason the fall 2014 results were higher than the spring 2014 results is due to summer break and changing teachers and classes. This will have to be tested again in a future study to validate these results. 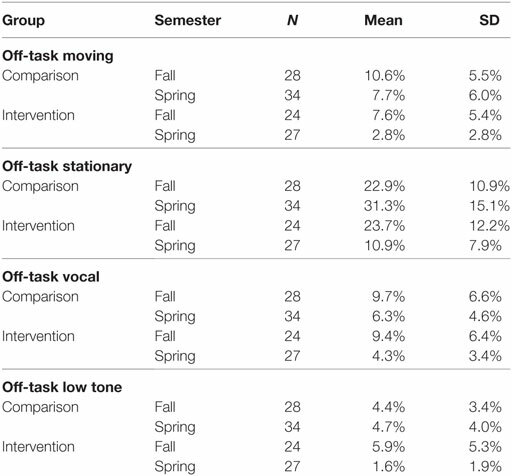 Conversely, the comparison group, in same grade levels as the intervention group, did not decrease in off-task behaviors or improve their listening skills from fall to spring. This shows that if maturation effects could explain the improvements, then both groups would have significantly improved as was seen from fall to spring in Year 1. Overall, the teachers stated that children in the past were more off-task and disruptive at the end of a school year than at the beginning of a school year. This study showed that the intervention was instrumental in decreasing off-task behaviors and discipline problems that are usually present at the beginning and end of a school year as shown in the comparison student population. Research has shown that activity offered before and after school will have positive learning effects on children (Ratey, 2013). This finding was shown to be less effective with comparison of these two schools. The results showed that having shorter bouts of unstructured, outdoor play throughout the day of at least 45 min total is more effective for appropriate classroom behaviors and listening focus than activity before or after school and only one recess of 30 min during the middle of the day. Fidgety behavior also became much more evident within 40–45 min of classroom activity even with three recesses daily. This shows that adding that fourth recess to the daily schedule in future years is most likely needed. Those critical of increasing the amount of daily recess are the ones who question how many recesses are necessary to have the best learning environment for children. Other country educators/school officials, especially Finland, would respond that unstructured, outdoor play is needed every 45 min throughout the school day for all grade levels. This intervention shows preliminary support for that mindset. It seems to be more important to engage the students in unstructured, outdoor play throughout the day than emphasizing content for an average of 7 hours daily with only indoor, short, structured breaks. Several limitations are identified for this study. Year 1 only examined the intervention group with no comparison group. Due to the complexity of this intervention (several transitions during the day for recess and a new character curriculum) and being the first time any type of intervention has been tried like this, the main goal is to see if the intervention could be executed correctly and still create change in behaviors and listening skills. The first year results were very promising so the comparison school was added in Year 2. In working with schools, it was understood that there would be summer months in which the researchers would not have contact with the students (participants) of the intervention. This is a limitation with a longitudinal study as it may have led to a student behavior regression due to changing groups of students in classes and the teacher they have each year. This could explain why there was a return of off-task behaviors from spring of 2014 to fall of 2014. Future studies need to examine this type of change more fully. Data collection and statistical analysis were collected aggregately instead of by individual tracking points. This was due to the large amount of data that were being collected. As a result, individual observing, it was likely they knew if they were on an intervention or control campus. The intervention school announced publicly that they were implementing the program (comparison did not make any announcements about being involved in the study or that they were serving as comparison). Also, the daily schedules at each school (addition of recess in one) made it harder to shield the raters from that information. The LiiNK intervention has been influenced by play and character research, as well as Finnish reports and studies published on the importance of children’s play in a school setting (Sahlberg, 2015). The Finnish Board of Education (2016) has required for many years that for every hour of content, 15 min of that hour must be unstructured, outdoor play. They also require a focused character curriculum weekly. Other countries are adopting this protocol in varying ways. Conversely, in the United States, schools have become much more focused on indoor activities that produce sedentary behavior with little or no time allotted for unstructured, outdoor play (Erickson et al., 2015). Given the methodological limitations of this study (i.e., no ability to randomize the participants within the school setting, no comparison group the first year, no covariance analysis), these preliminary findings suggest that the LiiNK intervention may have the potential to decrease classroom off-task behaviors, while increasing classroom attentional focus in grades K–2 children in a private school setting. Although the data represent a small cohort of students, it is still representative of all children per grade level at that particular school in comparison to another private school with typical school practices. Future studies will have to examine further the impact of teachers and student gender on this intervention. This study confirms the need to explore the LiiNK intervention in a larger number of schools, across both public and private settings. A looming question is whether this type of intervention can work with children who are more socioeconomically disadvantaged, ethnically diverse, or have been diagnosed with different learning differences (i.e., ADHD). LiiNK will be implemented in varying types of public school settings in the next phase of the intervention along with adding a fourth recess to the schedule for a total of 1 h daily in an unstructured, outdoor play environment. This study was carried out in accordance with the recommendations of the Institutional Review Board at Texas Christian University with written informed consent from all subjects. All subjects gave written informed consent in accordance with the Declaration of Helsinki. The protocol was approved by the University IRB committee in 2014, 2015, 2016, and 2017, each year that the intervention has been implemented. DR is the primary author who wrote a significant portion of the manuscript and conducted the study with the help of several graduate students, a statistician, and one other member of the LiiNK team (AR). AR is the project manager with LiiNK and contributed not only to the collection of data, but also the statistical analyses and writing of the manuscript. The Miles Foundation (Fort Worth) partially funded the LiiNK Project research for the 2015–2016 year. The Andrews Foundation (Fort Worth) partially funded the LiiNK Project research for the 2015–2016 year. Alan C. Fox partially funded the LiiNK Project research for the 2015–2016 year. Texas Christian University partially funded the LiiNK Project research for the 2015–2016 year. Brigance, A. (2010). The Listening Comprehension Curriculum Measurement-II. Brigance Diagnostic-Comprehensive Inventory of Basic Skills II, Revised. North Billerica, MA: Curriculum Associates. Centers for Disease Control and Prevention. (2015). School Health Policies and Practices Study: 2014 Overview. Atlanta, GA: U.S. Department of Health and Human Services. Flay, B. R., and Allred, C. G. (2010). “The positive action® program: improving academics, behavior and character by teaching comprehensive skills for successful learning and living,” in International Research Handbook on Values Education and Student Well-Being, eds T. Lovat, R. Toomey, and N. Clement (New York: Springer), 471–501. French, B. F., and Glascoe, F. P. (2010). Comprehensive Inventory of Basic Skills-II Standardization and Validation Manual. North Billerica, MA: Curriculum Associates. Gray, P. (2013). Free to Learn: Why Unleashing the Instinct to Play Will Make Our Children Happier, More Self-Reliant, and Better Students for Life. Philadelphia, PA: Basic Books. Marchant, G. J. (1989). StRoBe: a classroom-on-task measure. Paper Presented at the Annual Meeting of the Midwestern Educational Research Association, Chicago, IL. Organization for Economic Cooperation and Development. (2016). PISA 2015 Results (Volume I): Excellence and Equity in Education. Paris: PISA, OECD Publishing. Ramstetter, C., and Murray, R. (2017). Time to play: recognizing the benefits of recess. Am. Educ. (Spring) 41, 17–23. Ratey, J. J. (2013). Spark: The Revolutionary New Science of Exercise and the Brain. Paperback Edition. New York: Little, Brown, & Company. Rhea, D. J. (2016). Recess: the forgotten classroom. Instruct. Lead. J. 29, 2–6. Rhea, D. J., Rivchun, A. P., and Pennings, J. (2016). The LiiNK project: implementation of a recess and character development pilot study with grades K & 1 children. Texas Assoc. Health Phys. Educ. Recreat. Dance J. 84:14–35. Sahlberg, P. (2015). Finnish Lessons 2.0: What Can the World Learn from Educational Change in Finland? New York: Teachers College Press, 1–264. Copyright: © 2018 Rhea and Rivchun. This is an open-access article distributed under the terms of the Creative Commons Attribution License (CC BY). The use, distribution or reproduction in other forums is permitted, provided the original author(s) and the copyright owner are credited and that the original publication in this journal is cited, in accordance with accepted academic practice. No use, distribution or reproduction is permitted which does not comply with these terms.